The Borno state Police Command has paraded four-man suspected gang in connection with the kidnapping of one Usman Hassan of Tugs village of Damboa local government of Borno state, where they demanded the ransom of N21 million. Parading the suspects at the Police headquarters, Maiduguri, the Borno state capital Monday night, the Police Commissioner. Mr. Damain Chukwu said "on 13th December, 2018 at about 02;00 hours one Usman Hassan of Tugs village of Damboa local government area was kidnapped".
" On 17 December, 2018, at about 20:10 hours, information reached DPO Askira Uba of the kidnap, I mobilized personnel and the Civilian JTF moved to the victim's house and laid ambush on the date the kidnappers came to collect the ransom of N21 million from the relatives". "One Usman Abdul took the police to to their hideouts,where two other suspected were arrested and the victim rescued. One Musa Haruna in whose house the plan was hatched, was equally arrested," Chukwu said. Chukwu further said that some relatives of the victim who sustained serious injuries during the rescue operation are currently receiving treatment at General Hospital, Mubi in Adamawa. 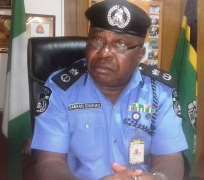 The CP added that all the suspects confessed to the crime during preliminary investigations and claimed that they organized the the kidnap to get back their 47 cows and 83 sheep earlier stolen.
" Exhibits recovered from the kidnappers includes, one AK 47 rifle, 30 pices of live ammunitions, one locally made single barrel gun SNF Barrera pistol with 2 pieces of live ammunitions, " Chukwu said. He also explained that the command is still on trail of fleeing suspects, while the arrested suspects will soon be charged to court. The Police Boss called on the general public to be wary of the new trend and be vigilant, and as well report any suspicious movement and objects. In a related development, 248 bags of Indian hemp worth over N68 million intercepted on 20th August, 2014 was destroyed in compliance of the the court order. He said, " On December 20th, 2014 at about 20:18 hours, following a tip-off, a truck suspected to be conveying a large quantity of dried weeds suspected to be Indian hemp, was intercepted by operatives of the FSARS in Ngomari/Jimyilo general area." According to him, on sighting the police. The driver of truck, one Mr. innocent jumped out and abandoned the truck with the consigment, while a persenger, one Kols Aladejobi was apprehended.
" A total of 248 bags each containing 20 percells of the substance was found neatly packed in the vehicle covered with Cheese Balls to evade detection while being conveyed from Edo state to a customer in.Maiduguri," the CP further explained. He disclosed also that police recovered a stolen vehicle with Abuja AF 238 MDS which was intercepted and impounded in Maiduguri metropolis on 18th December, 2018 from the occupant, Bilal Babayola of Federal Lowcost, Maiduguri. she claimed to have bought the car from one Abdulkadir in Kaduna. During investigations and scrutiny of the vehicle's particulars which bears the name of one Mrs Abigal Charles of FCT Abuja, Mr Chukwu said her phone number was found and when contacted, she confirmed that the vehicle was stolen from her sometimes in September, 2018.. He said investigation has been intensified for possible arrest of other suspects at large while the stolen vehicle will be released to the owner on production of genuine proof.